Ashram Road, Opposite Handloom House, Near Vallabh Sadan, Ahmedabad, Gujarat 380009, India. From finding heart of tinman and winning from the evil wizard. English-vinglish funny drama. we will present you unexplored complete entertainment this summer which will be nostalgic and bring you back from your childhood days. The complete family entertainment is going to be in the heart of Ahmedabad this summer 14th April at HK auditorium. We are more than excited for you lots of surprises. We can’t wait to hear back! mission with sponsorships and any other collaboration please contact at the following details. 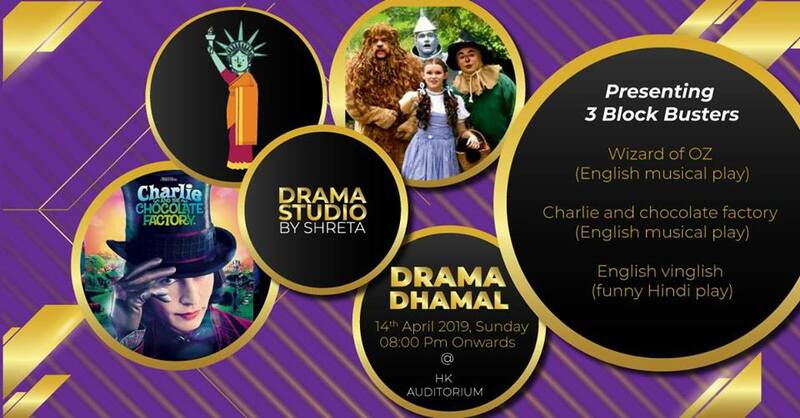 Drama Studio by Shreta would like you to be a partner with us for our upcoming 2019-2020 season. Performances and sponsorships are great ways to show that you support the arts in your community.